Relationships have been a key part of business since the beginning of time. Lobbyists need the attention of their politicians. Public relations professionals need the interest of reporters and editors. And similarly, media sellers need the time and interest of media planners if they are ever to be recommended on a media plan and win a piece of a client’s budget. We would never question that a media seller would give time, thought and energy to connect with his or her prospect. Sellers work hard to book an appointment and gain face time with their potential media planner/buyer, which often means learning what they can about the client, agency and buyer before even reaching out for the first time. But, why is there so much focus on the benefit to the seller? What about the benefit to the buyer, who is acting as the agent for their client? Aren’t there benefits to good relationships for ALL parties involved in a transaction? Twenty-five years in the media business has proven to me that the answer is a resounding YES! Most buyers expect quick (immediate) responses from sellers, usually because of pressure being put on them by a client, account manager, or deadline. In some cases, those buyers are the same people who ignore rep communication, without respect to the pressures they may be under. Even if it is a short, canned answer, a quick email of acknowledgement goes a long way. I’m still amazed at the sound of shock and surprise, and usually the gratitude, expressed by sales reps at the simple act of a media person returning an email or phone call these days! It really shouldn’t be so novel. Many media sellers have been media buyers. 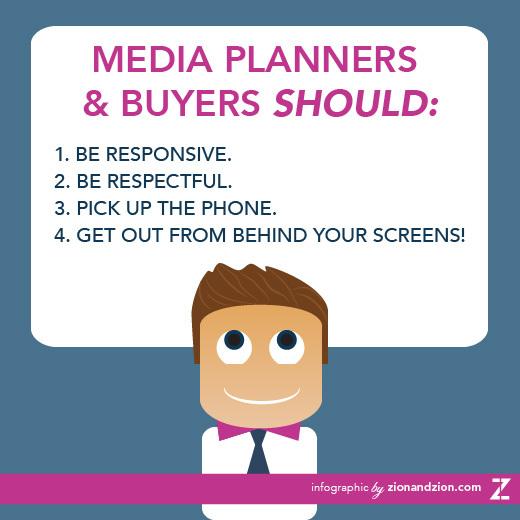 Many media buyers have been media sellers, be it TV, radio, print, outdoor/billboard, or digital sales. Just because you happen to be the one holding the client’s budget does not mean you are not entitled to be rude, condescending or otherwise unpleasant towards sellers. “Media Queen” is generally not a complimentary term. Being respectful also includes patient listening. You don’t know what you don’t know, so be a good listener and think creatively about how you can use what the seller is offering to do better work for your clients. If you are rushing a seller or looking at your phone as someone is trying to explain something, you aren’t truly listening. This one can be challenging, as many media planners have a default attitude that can be somewhat negative, as they have so many options being presented to them every day, and their job is to scrutinize both the strengths and the shortcomings of any given product. Taking a quick moment to let someone who worked hard on a proposal for you know if you can’t use them, and why. You will spend far longer fielding multiple, drawn-out email conversations where it can take many hours to reach a conclusion, than you would just having a real-time conversation with one person. Make one call, have one conversation and move on. Most importantly, if there’s even suspicion that an email you’ve received might have come from an annoyed, unhappy or offended sender, a phone call can rapidly diffuse a situation. If for no other reason, it proves you cared enough to take the time to address the situation. There are many reasons to pick up the phone, but diffusing confusion and frustration might be the best one. 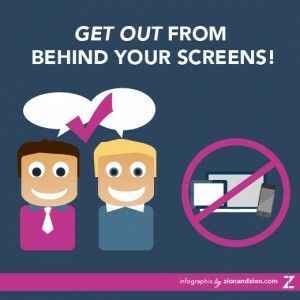 Get out from behind your screens! Nothing helps you get to know a person better and faster than face-time. Tone of voice, body language and facial expressions communicate far more than words often do, and eye contact makes a connection that surpasses any email or phone call, and is not as easily forgotten. She pleaded on my behalf to her manager, and ended up honoring the lower rate. Do you think that if she was a salesperson who I didn’t spend the previous two years building a respectful relationship with, would have taken the necessary time and decreased commission to fight for my cause? I think not. Technology has changed how business is done, and even the act of buying advertising can be done through digital platforms with things like programmatic buying. We are in a unique business. Is there another industry outside of media sales where hugging after a first meeting is common, and where personal and professional networks are so interrelated? We are a unique group. If you’re a media professional and are not developing meaningful relationships with your media partners, you’re not doing your job as well as you could be. Part of the value media planners and buyers bring to clients is the time spent learning about new offerings from media partners, and developing those relationships by managing communication and staying abreast of opportunities. As a media planner or buyer, you become an extension of the clients themselves. Act as if your client is monitoring your every communication, and then you’ll know you’re doing great work. Finally, who wouldn’t agree that it sure makes things more pleasant when you get to work with people where the respect is mutual? Now, go book lunch with someone! You might even get a hug! Prev post : What is User Experience (UX)?